After a diagnosis of PID, patients often feel lost juggling treatments, appointments and life decisions. For a PID patient education about his/hers therapy is crucial for greater independence and better quality of life. The World Health Organization defines patient therapeutic education (PTE) as the means to help acquire or maintain skills to better manage chronic illness. 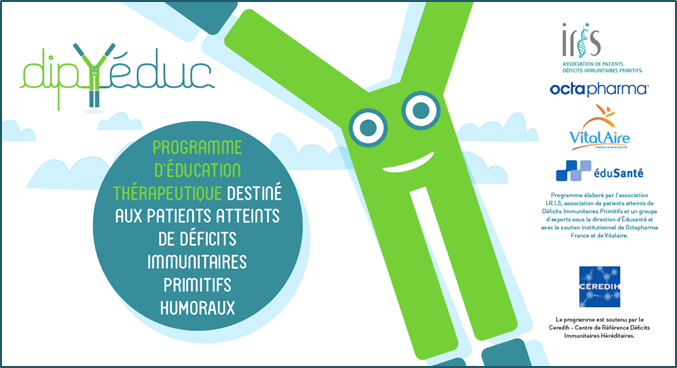 Following this definition IRIS in partnership with the French reference center for PIDs (CEREDIH) developed an education program for adult PID patients with humoral immune deficiency called “DIP &EDUC!”. 3) Acquired skills assessment done by the patient.